The picture above is just weird. 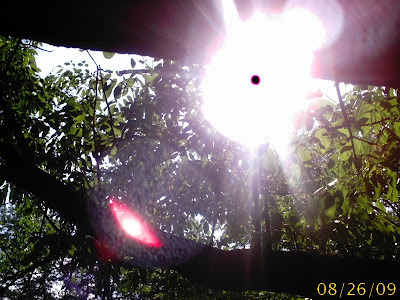 Look at it close, you see the bright red spot on the tree branch? I checked the tree after I took this picture and there is nothing that is reflective. I am not sure why it did this at all. It actually looks like to me that its a heat signature. But I am not sure. This flower is the only flower left in my yard. But it sure is beautiful. When I first spotted it in my yard, the sun was making it glow. It was the only place that the sun was hitting at the time. By the time I got back with the camera, the sun had moved and it is now behind the flower. That's a hibiscus, or Rose of Sharon. I love them, and their flowers are large, numerous, and beautiful! @ Beth, yes you are right about being numerous, the bush normally has 20 or 30 blooms a year. Very pretty hibiscus. I have purple ones in my yard but I think I like your pink better. Stop by my blog. I have an award for you. @ Rae, I think I would like the purple ones better, (my Favorite color). But the pink ones are just wonderful. Also, thank you for the Award! What a stunning color Allen. 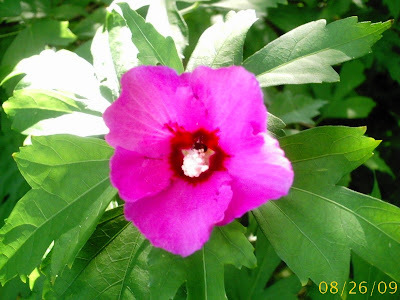 Rose of Sharon are difficult to grow here, but we do have one that is about three years old. Last winter we lost half of it, but it recovered. I'm going to have to take steps to cover it in winter to protect it. @ Wonder Man, Yeah it was weird. I like taking weird pictures, like taking the underneath of trees. @ Kyle, Covering it up would be a great idea. It might even help with the blooms in the spring. Thanks to everyone who has left me a comment.